At Trabolgan we offer a wide range of entertainment, indoor and outdoor sporting pursuits, children’s activities and teen clubs to keep the entire family occupied be it for a week, midweek or weekend stay. With everything from restaurants, bars and shops all on campus, Trabolgan is the “perfect location for every occasion”. Whether you are planning to relax and unwind or are looking for something with lots of entertainment and activity, Trabolgan really does have it all. 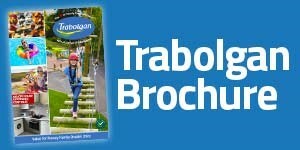 Check out why you should choose Trabolgan for your next family holiday or short break. Trabolgan is the place to be in 2019, if you are looking for the very best kids entertainment and activities. Kids Korner provides lots and lots of Activities for Toddlers, Kids & Teens; and make sure you check out the wide range of indoor and outdoor facilities available. Alternative, don’t miss out on the great line-ups of Childrens Entertainment, activities and interactive games available all year- click here. Family Restaurants, breakfast bars, fast food eateries; as well as great entertainment hotspots and a tantalising variety of stores–click here for more on the facilities available in-centre in Trabolgan. We love a challenge at Trabolgan so we've got some really exciting activities available at an additional cost for the whole family to experience. Find out about the range of adventure sports available. “Combat Laser” adventure sport activity will remain at the holiday village for this season- make sure you don’t miss out- click here for more on combat laser. Stretch those legs and enjoy a game of golf at our 18 Hole Par 3 Clifftop Golf Course or why not get the whole family to try their hand at a fun game of Crazy Golf? Oh, and did we mention the Indoor Sports Complex and Strike Bowlingo Alley? Click here for more on the great range of sports facilities available at Trabolgan! We offer a range of great quality holiday homes from intimate one-bedroomed houses right up to our largest homes that can accommodate up to nine people- find the self catering accommodation that suits you. If you are planning a Cork caravanning break and require a holiday park with superb facilities, make sure you check out the touring caravan facilities available at Trabolgan.